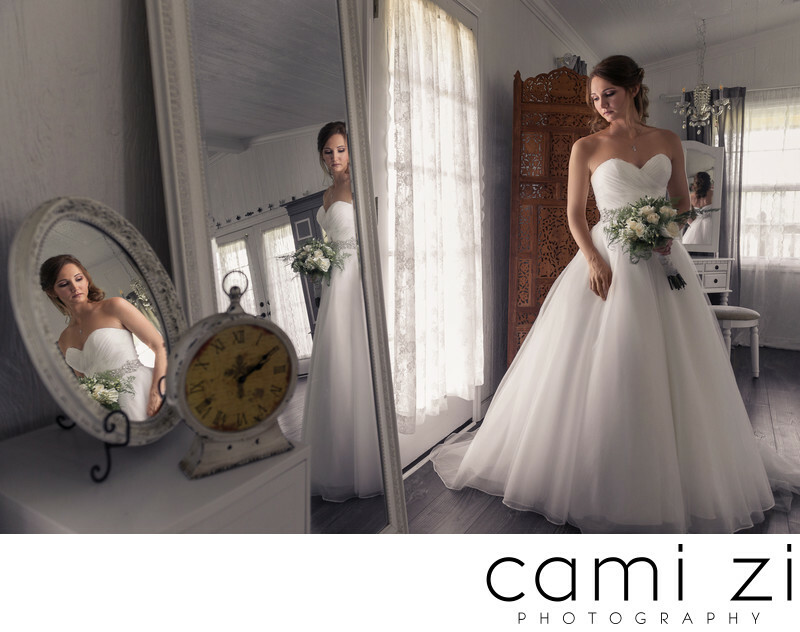 This photo features the beautiful bride Emily as she stands in the lovely bridal sweet at Wishing Well Barn in Plant City Florida. In this photo the highlighted aspect is reflection, as she takes a few minutes to breath before the ceremony starts you can see the quiet thoughts of the past and hope for the future reflected on her face. When you take a closer look at this image you can see a third reflection hidden directly behind her left shoulder. Looking at this scene brings a sense of peace, joy and optimistic thoughts for an exciting future. Keywords: Barn Weddings (156), Cami Zi Photography (468), Country Weddings (156), Florida (6), Florida Weddings (171), Plant City (156), Tampa Wedding Photographer (156), tampa weddings (159), wedding day (156), Wedding Photography (156), Wishing Well Barn (156).